Emily Davies Writes: UPDATE: What's in a Name? You may remember this post where I bemoaned our confusion regarding baby names. What a responsibility to choose a name for our child that they have to live with forever! We really had no idea! We arrived at the hospital on Easter Sunday none the wiser. We had decided on the two middle names, but the first name we were stumped. We had a shortlist of three and neither of us could decide. Everyone had told us 'You'll know when you see her'. Really? We didn't. There was no lightening bolt, booming voice from heaven or angels saying 'And she will be called Ruby'. But there we stood (ok, I was lying down) in the dim light of the birthing room, covered in blood and gore (romantic I know), Jon held her in his arms. And I said 'so shall we go with Ruby then?' And he agreed. Rubies are precious jewels. Biblically they symbolise preciousness, great value, costly glories, wisdom, and prized treasure. And apparently in many ancient cultures they are considered to be the rarest and most precious treasure of all! I hope Ruby is always aware of how precious she is to us, but I'll take great joy in explaining her name to her! After suffering two miscarriages I knew that if we were to have a girl, we would call her Hope. Because she would be our Hope fulfilled. In her would be everything we had dreamt of, wished for and hoped for. It was the expectation of her eventual existence that kept us hoping. Hope is confident expectation, the sure certainty that what God has promised will come to pass. We place our hope in Jesus Christ because we know that he will come through for us. Having a strong and confident expectation gives us Faith. The Bible says "Faith is confidence in what we hope for and assurance of things yet unseen". It was faith that allowed me to hope. Now, I can look at Ruby and she strengthens my faith because she is testament to God's faithfulness. She was once yet unseen but she is now seen. She is God's promise come to pass in our lives. 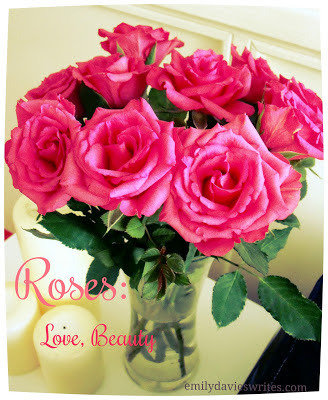 Roses are traditionally symbols of love and beauty. Not only do we love Ruby incredibly, but we hope that she will grow up to be someone who extends unconditional love (grace) towards other people. We also hope that she will grow up to be a beautiful young woman, both inside and out. Unintentionally Rose also means 'Red' in a variety of languages and Rubies are obviously Red too. Red signifies blood (which relates to sacrifice, the blood of Jesus and life), passion, fire and happiness. All things that we hope Ruby will grab hold of, stand firm on and experience in her own life. And finally Rose is linked to Ruby's Nana, my mum, Rosemary. An inspirational woman of God, gracious beyond comprehension, gentle in spirit, beautiful and passionate. Someone I hope Ruby grows to love, cherish and look up to. So there you have it. Three names that combined create the perfect description of our hopes and dreams for our dauughter, Ruby. I hope that one day she will be able to read this and know that although we didn't always know what to call her, God knew that these names would be perfect. I hope that reading the symbolism and significance of these names will give her a sense of identity that she can hold onto as she gets older. What was the significance behind the names of your children? Comment below. Thank you! I will have a read, find everyone's reasons so interesting! Oh that was lovely :-) I never knew what the name Ruby signified,now I do and I think it's perfect! Thank you Jess! I wasn't sure at first, I thought I would instantly fall in love with a name and it didn't happen that way. But the more I think about the name Ruby and what it signifies, the more I love it! I'm glad other people love it as much as I do! Thank you!